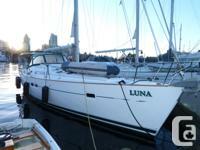 This Beneteau 423 is ready for your cruising adventures near or afar. An excellent performance cruiser with loads of options. 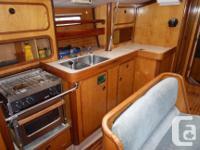 This is a one owner boat, never chartered, consistently well maintained by an experienced owner. -Lightly pre-owned locally-Racing sails (only pre-owned six times)-Spinnaker pole & deck upgrade-Dodger & Bimini -Lots of upgrades and extra equipment Additional Specs, Equipment and Info: Specs Builder: Beneteau Designer: Groupe Finot Flag of Registry: Canada Hull Shape: Monohull Dimensions LOA: 43 feet 2 in Beam: 12 feet 11 in LWL: 41ft 8 in Length on Deck: 41ft 8 in Min Draft: five feet 7 in Max Draft: five feet 7 in Headroom: six feet 6 in Dry Weight: 19797 pounds Engines Total Power: 55 HORSEPOWER Engine 1: Engine Brand: Yanmar Year Built: 2007 Engine Type: Inboard Engine/Fuel Type: Diesel Engine Hours: 600 Prop: three blade prop Drive Type: Direct Drive Engine Power: 55 HORSEPOWER Tanks Freshwater Tanks: one (154 Gallons) Fuel Tanks: one (53 Gallons) Holding Tanks: two (22 Gallons) Accommodations Number of double berths: 2 Number of cabins: 2 Number of heads: 2 Electronics Wind speed and direction Compass Log-speedometer VHF Radio Plotter Autopilot Navigation center GPS Depthsounder Compact disc player Sails Furling mainsail Spinnaker Genoa Furling genoa Rigging Spinnaker pole Steering wheel Electric winch Inside Equipment Deep freezer Battery charger Heating Manual bilge pump Refrigerator Electric bilge pump Microwave oven Hot water Electrical Equipment Shore power inlet Outside Equipment/Extras Swimming ladder Cockpit table Teak cockpit Cockpit shower Tender Liferaft Electric windlass Covers Bimini Top Spray hood Design Elements This two cabin version affords a large well laid out galley, seating for six at the dinnette and a designated nav. station.- All new thru-hulls and full equipment check in 2014- Basic safety gear updated March 2015- EPIRB need serviced- two cabins with double berths- two head- Racing sails ( pre-owned six times only) include: Nordac Race Mainsail NSP Prem. 8.8H Kevlar med/heavy #1, 150% Spinnaker Code 2S Norlon 75 with Snuffer- Deck racing upgrade- Dacron cruising sails roller furling Main and 140% Genoa Extra features Cadet 285S 2006- Spinnaker pole- Life sling 2- "U" shaped dinnette converts for a additional double berth Salon The 423 unique deck skylights give the salon and galley a bright and spacious feel. Stereo: with 12 CD stackerOther: two cabinets with louvered doors storage behind dinette with bottle racks storage and access to plumbing and hot water heater under dinette. central settee with storage 6'5" headroom Galley Spacious galley with good storage and counter spaceStove: force 10, 3 burner LPG stove/ovenMicrowave: yesFront loaded fridge and top loaded freezer, both 12 volt.Other: 6'4" headroom Master Stateroom Forward cabin has an island style double berth and its own head with separate shower stall. Double sized bedStorage: 2 drawers and 1 storage locker under berthHanging locker to portsettee with storage locker6'1" headroom VIP Stateroom All cabin has a very large double berth and 6'4" headroom Hanging locker, storage cabinet and shelf on the hullEn Suite Head: head/shower combo.This head can be entered from the aft cabin and/or salon. Comfort Features A well laid out cockpit with a good sized folding table to enjoy outside dining. Heat: Webasto Hydronic Deisle cabin heaterOther: hot and cold cockpit showerOther: walk through transom with platform and swim ladder Electronics- Upper Helm GPS: Chart Plotter in salon with repeater at helm Depth Sounder: Raytheon ST60 TridataAutopilot: ST 6001VHF: Intrepid VHF radio with remote in cockpitOther: Wind: Raytheon ST60 Wind Mechanical/ Electrical Very well maintained since new with records and log. 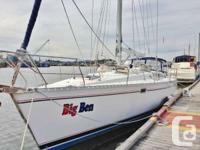 House batteries: 2-200 ampstart Batteries: 1-100 ampBattery Charger: 40 ampShaft Seals: no drip Deck & Anchoring Well equipped for extended cruising.Canvas: Dodger & Bimini (Eisen glass replaced in 2010)Windlass: Horizon Express electric windlessAnchor: two Bruce, 1 FortressChain/Rode: Chain and ride for all threeOther: Dual bow rollersOther: Aft shore line on drum that can store on the pushpit Sails -Rarely does a boat come equipped with dacron furling sails for convenience and a set of racing sails for performance with a track on the mast of classic rigging. 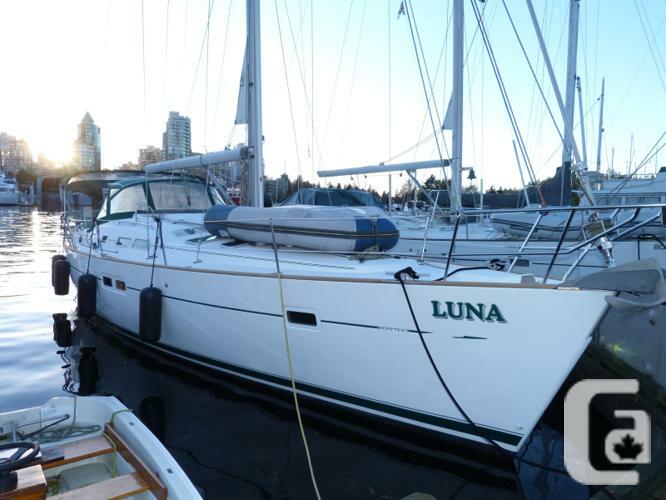 Luna includes: Disclaimer The Company offers the details of this vessel in good faith but cannot guarantee or warrant the accuracy of this info nor warrant the condition of the vessel. A buyer should instruct his agents, or his surveyors, to investigate such details as the buyer desires validated. This vessel is offered subject to prior sale, price change, or withdrawal without notice.Canadian vessels are for sale while located in Canada and are not for sale while located in the USA. Foreign registered vessels are not for sale while located in Canada.